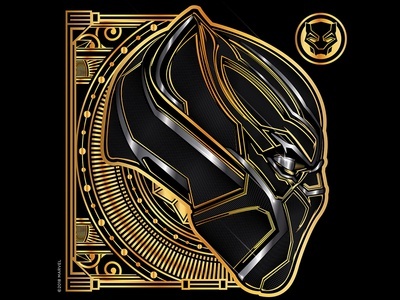 Looks like we will be getting a Black Panther movie!!! The Marvel film world is also about to get a lot more diverse. For the first time an African American hero will headline a film with Black Panther which hits theaters November 3, 2017. Feige says there should be an announcement soon about who will direct Captain Marvel. There are firmer plans in place for Black Panther. Chadwick Boseman, who played Jackie Robinson in 42, will play the superhero and today he appeared onstage with Robert Downey Jr., who plays Iron Man, and Chris Evan, who plays Captain America. Feige said fans should definitely read into that and understand that Black Panther will be a big part of the upcoming third Captain America film which will be called Civil War. He may also appear in the upcoming Avengers 2 which hits theaters May 2015. Feige said that fans should look for “Easter egg” in the Age of Ultron trailer. Here’s what to look out for in phase 3. Re: The Black Panther Movie!!! OK Reg, I think it is safe enough for you to announce that you will be either writing, directing, producing, consulting or some combination thereof on the upcoming Black Panther film. True indeed Princesa. Seeing Cap's shield in fragments made me think of Earth's Mightiest Heroes when they journeyed to Wakanda to get it repaired; that and seeing Klaw in the Age of Ultron teaser did in fact whet my appetite for the live action version of the Black Panther. Now let us be satiated by a very well done film. You got that right Booshman. Time to tell Rutog that the Black Panther is reclaiming the title of HEF's most talked about Afrakan (so called black) superhero/heroine. Awesome news. I like the concept art. But it needs some gold. Neither Ruckus98 nor Storm mean anything to me, and have just become increasingly irrelevant to my world. If Hudlin has any part in this movie, it'll make an already good day A PHENOMENAL ONE! If they get Raw Leiba to play Killmonger after all, then this will be the first movie that I'll see TWICE in a theater. Oh, who am I kidding? I'll probably see it twice regardless. ...In fact, that wasn't even close to all: Feige was joking about the subtitle for the "Captain America" movie, and confirmed that "Captain America 3" is actually "Captain America: Civil War." Chadwick Boseman was confirmed as playing the Black Panther, and came onstage alongside Robert Downey Jr. and Chris Evans. "I'm blessed to be a part of this Marvel Universe, to work with you both and to make magic together," Boseman said. 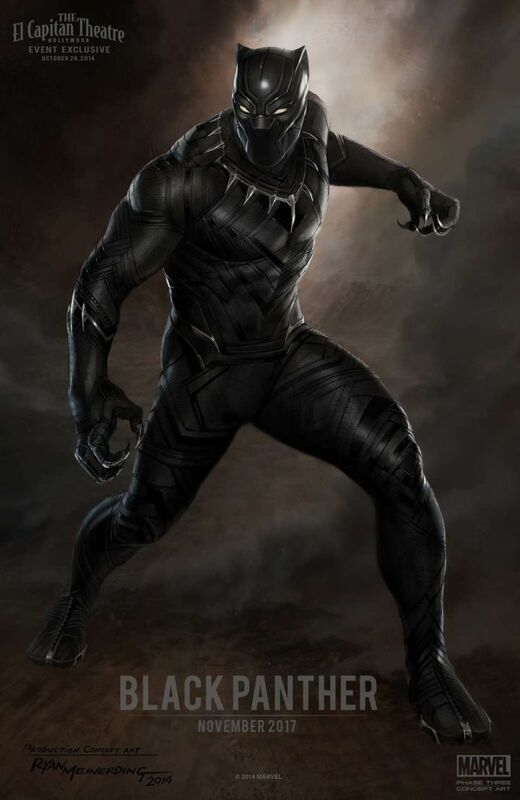 "Black Panther" is made official for Nov. 3, 2017 -- "T'Challa himself, and all of Wakanda" -- is coming to theaters on . "We have already started seeding things in the films leading up to this moment," Feige said, calling Black Panther one of the most exciting and integral Marvel characters. The film will be about the "isolationist nation" of Wakanda meeting the rest of the world, which may go well and may not. Real talk! I would wish you could be available for the BP flick, Ture. You are the BP! Of course, I would add several others from the HEF. The true campaigners. You know who you are. Big-ups! Myself included. I halted W.W.O. because it was way too ahead of the game & I didn’t want to sh*t-on these muthaf*ckaz! I tried to downplay my own story, just to give others a shot & not step on any toes. I did it out of respect. I trusted the HW to pull it together. "Honorary Wakandan Status" is part of the reason why I joined. (I joined for BP/Ororo & the legacy RH brought to the characters) The Honoraries need to stand up. Yeh, I said it! Do I have to p.m. everybody? Cuz, I will! Is there another place where honoraries exist? If this film goes off without you, what would that say about you, Honorary Wakandans? Too much? I know! The truth only hurts the guilty. I knew this was going to happen for T'challa. Glad I was right and even happier it didn't come up as some kind of spin-off of some Avengers movie where movie goers would have to be introduced to the character on one of those movie first. Iron Man, Captain America and Thor got to have their solo movies first, why couldn't T'challa? Great news.